Take And Share Meeting Notes | Brand On! I think most meetings are poorly documented. One reason is that everyone takes their own notes—if they bother to take notes at all. Rarely does the group pool their notes, and most importantly agree on what the next steps, action items and responsibilities are. 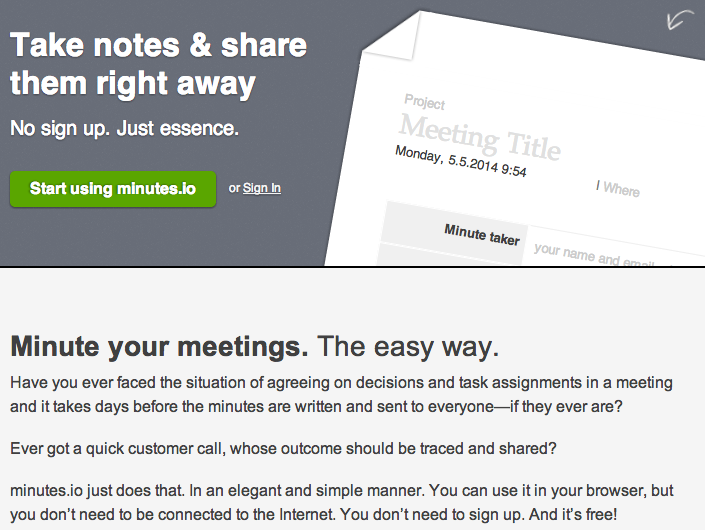 Minutes.io is a tool that makes meetings more productive. Just designate a “minute taker,” and use Minutes’ simple interface to capture the discussion. It’s tablet-friendly and can be used offline in case your meeting room lacks Internet access. As you type, you can choose from four basic types of notes: Todos, Info, Ideas and Decisions. With each entry, you can optionally assign an “owner” and a due date. After the meeting, simply enter attendees’ email addresses to send each a copy. Cost: Free; there is no initial signup necessary, but make sure you set up an account the first time you use it so you can access your minutes later.